Check Out This Woman’s Attempt To Forge A License Plate. Who ever thought they would get away with this probably should have had their license suspend in the first place anyways. A Massachusetts woman who had her license suspended decided that she was going to drive her vehicle anyways. Oh yeah, and that she was going to make a fake license plate out of cardboard. A state trooper noticed that there was something a little odd about the license plate on a car that she had spotted on Interstate 391 in Chicopee. When getting closer she saw what was wrong with it too and so can you when looking at the picture of it. The 20-year-old driving the car got pulled over around 7:30 a.m. and the officer found that her license plate was made out of cardboard. 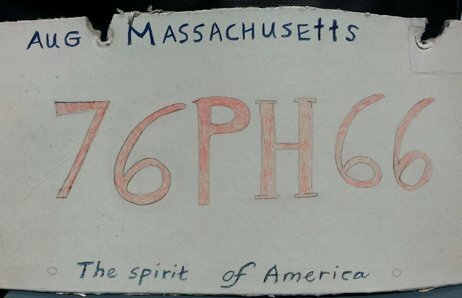 She had also, very poorly, attempted to replicate a real Massachusetts plate, drawing the letters and numbers with crudely drawn red marker. The state and month as well as the phrase “The Spirit of America” were written in the rightly positioned places with blue pen. The woman was clearly cited for attaching false plates and driving with a suspended license.